Huawei’s sub-brand Honor has revealed that it will be launching its 20 series on May 21. 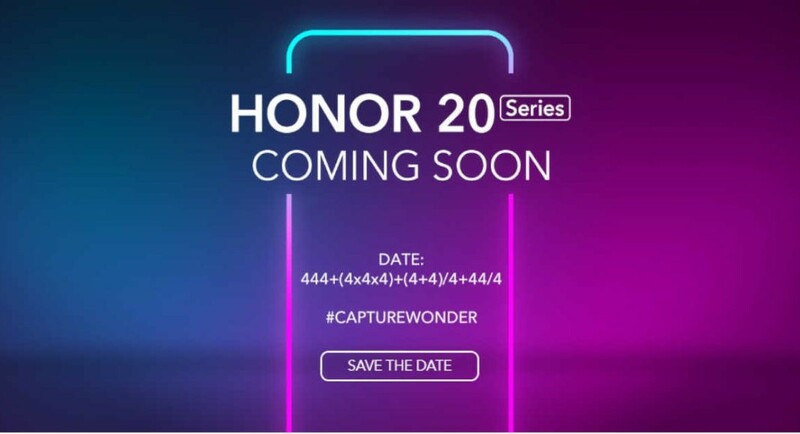 The Honor 20 series is all set to be unveiled globally at an event in London that is scheduled for next month. It is worth mentioning that the first smartphone that will be launched in the series is Honor 20i, which will also be launching in China on April 17. Chinese smartphone brand Huawei and its sub-brand Honor have already first launched their devices in China and then rolled them out globally a month later a few times. So, it is not a move that is not expected of them. As of now, very little is known about the upcoming Honor 20i smartphone, however, the company has shared some teasers that shed light on the resolution of its selfie camera. According to a report in the IANS, the company has said that it will be launching a few industry-first smartphones across different price-ranges. The devices will also be launched in India after the global launch. Honor took to Twitter to announce the launch date of its upcoming series. Honor 20 series will be succeeding the Honor 10 series and it is expected to come with Honor 20, Honor 20 Pro, Honor 20i, Honor 20A, Honor 20C, and Honor 20X. However, this is just a speculation keeping in mind the Honor 10 series launches. It has also been said that the Honor 20 will be the flagship smartphone of the company and will come with the HiSilicon Kirin 980 SoC. Reports also suggest that the smartphone will come with a triple rear camera setup that will comprise of a 48MP primary sensor, a 20MP secondary sensor, and a third 8MP sensor. Other specifications include Android 9.0 Pie, a 32MP selfie camera and a 3,650mAh battery. Details about Honor 20 Pro have also been leaked recently and the smartphone is said to feature a 6.1-inch OLED display, an in-display fingerprint sensor and be powered by the HiSilicon Kirin 980 SoC. The device will be available in three RAM/storage configurations — 6GB/ 128GB, 8GB/ 128GB, and 8GB/ 256GB. The smartphone is said to have the same triple camera setup at the back and the same selfie camera as the Honor 20. Other features will include Gaming+, Link Turbo, CPU, and GPU Turbo. Coming to Honor 20i, it is all set to launch on Wednesday and the company has teased a 32MP AI selfie camera and a waterdrop-shaped display notch. The smartphone is rumoured to come with a 6.2-inch full-HD+ display, be powered by a HiSilicon Kirin 710 SoC clubbed with 4GB/6GB RAM options, have 64GB/128GB of storage options and house a 3,400mAh battery.